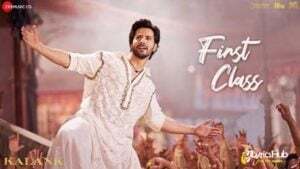 First Class Lyrics From Movie “Kalank” Sung by Arijit Singh & Neeti Mohan. The Music of the new Hindi song is given by Pritam while Lyrics penned down by Amitabh Bhattacharya. This Movie features Varun Dhawan, Alia Bhatt, Kiara Advani & Madhuri Dixit.